Brian Dare didn't last long in this late-August 1990 game and opposing manager Nick Belmonte counted his Salt Lake team fortunate, according to The Deseret News. "It's the first time this year we have been able to get to Dare early," Belmonte told The News. "He usually holds until until the middle innings." Dare, a veteran of the previous year's College World Series championship game, held on to finish that first professional season and the next. But he couldn't hold on longer. He played just two pro seasons, making it to single-A, but no higher. 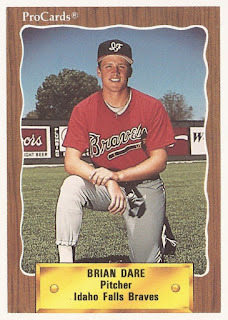 Dare's career began that year, taken by the Braves in the 36th round of the draft out of the University of Texas at Austin. He played his high school ball at Westlake High in Austin, where he won all-Central Texas and all-district honors in 1985 and 1986. With Texas, he went 5-4 in 1989, with a 3.32 ERA, then 8-2 with a 3.00 ERA in 1990. In 1989, he helped Texas to the College World Series championship game. Along the way, he received honors in the Midwest Regional. Dare pitched 14.1 innings for Texas in the 1989 College World Series tournament, including long-relief in the championship game. His team already down early, Dare gave up a two-run home run. "It got everybody down," Dare told UPI afterward of the early runs scored by Wichita State. "They were kind of cheap runs. But if you can score like that, you can win. That was the difference." 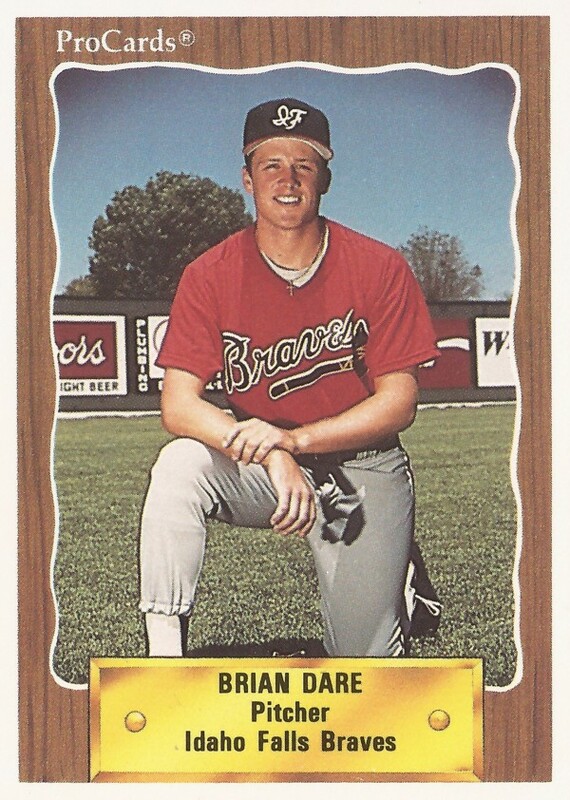 With the Braves, Dare played the 1990 season at rookie Idaho Falls. In 15 outings, 13 starts, he went 3-6, with a 4.05 ERA. He moved to single-A Macon for 1991 and pitched mostly in relief. He gave up a hit in a short June outing. Overall, he picked up three wins and two saves, with a 3.72 ERA. That season marked his final as a pro.